A COLD wind whips across a small patch of grassland in the north of Leigh Park as Dan Arnold rushes to organise a major search operation, writes defence correspondent Tom Cotterill. 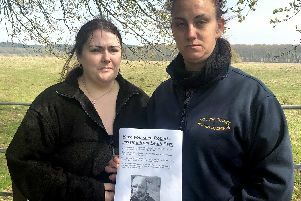 The former soldier and Afghanistan veteran is the co-founder of All Call Signs and has mobilised to hunt for missing ex-soldier Robert Ballantyne. The first rallying cry out to the group’s enormous army of followers went out on Sunday, just hours after Mr Ballantyne was reported as missing. ‘It’s a bit frantic,’ he tells me calmly with a wry smile on his face. Within minutes, volunteers begin to show up and are sent to work by Dan, searching woodlines nearby. More and more arrive, in cars, vans and 4x4s; many of them are current or ex-forces, some with dogs, some with just a rucksack and determination to help. Bognor-based drone expert Mark Boyt, who is partnered with All Call Signs joins the hunt, to search from the sky, while Steve Harris, of Newlife Church in Emsworth, delivers two crates of water for volunteers. An hour after the first teams leave, a call comes in to say they have found items believed to belong to Mr Ballantyne and were following a possible line of travel. Soon, police helicopters begin to arrive in the sky overhead as they begin to focus their efforts around the area All Call Signs were hunting. All of this is happening while Mr Ballantyne’s wife, Kirsty watches on. Little more than five hours later, Mr Ballantyne was found safe and well, an effort his wife tells me after was ‘remarkable’.